There are already far too many cats and puppies to go around. It’s hard to gauge exact figures but it’s estimated that between 50,000 and 3.9 million dogs alone enter shelters across the UK each year, and every two hours local authorities alone put a healthy but unwanted dog to sleep. This doesn’t take into account charities and dogs homes such as Battersea and RSPCA. Out of this number, only 10% have been neutered, and few are microchipped or have an ID. Don’t think that breeding from pedigrees stops abandonment either. 25% of shelter residents are specific breeds. One cat can have two litters of 4-6 kittens a year. Then those kittens the same each. Then their kittens the same, and so it continues. 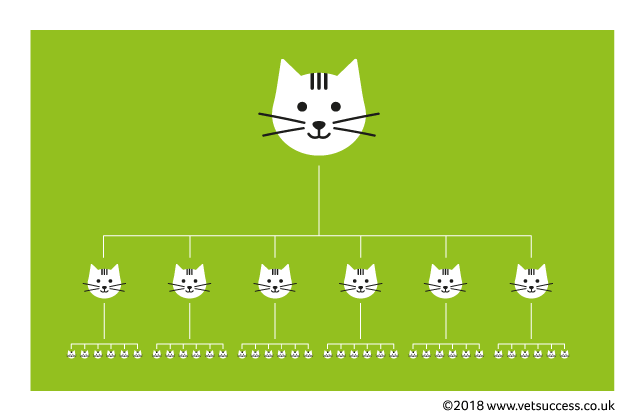 Within 7 years, one single cat can have resulted in 370,00 kittens being born. 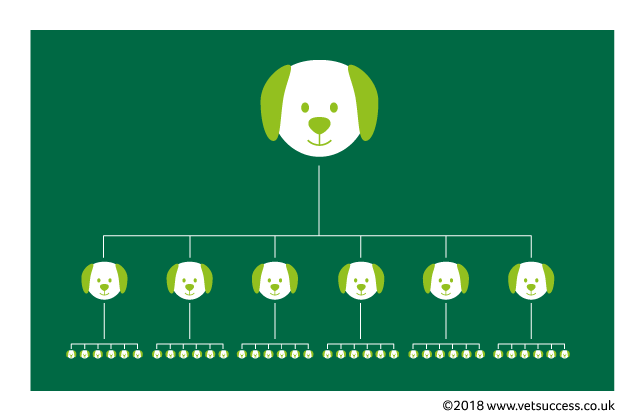 One fertile dog can have one litter of 4-6 puppies a year, and within 7 years can have been responsible for 67,000 puppies. Spaying helps prevent nasty womb infections such as pyometra which is seen quite often in un-neutered females and can be fatal. It also hugely reduces the risk of breast tumours, which are malignant or cancerous in about 50% of dogs and 90% of cats. The best protection from disease is gained if they are spayed before their first fertile season, and this can increase lifespan from 3-5 years. While cycles can vary, female cats can usually go into heat for four to five days every three weeks in the breeding season. They become desperate for a mate, act in strange ways, make awful howling noises and urinate more frequently wherever they find themselves. Keeping them in during this time makes no difference either – they will still howl, wee and scratch to get out. It can be so dramatic that seasons are often mistaken for a serious illness by inexperienced owners. When a female dog is in season, she becomes the most desirable thing an entire dog has ever seen. The odour makes them highly traceable, and even kept with the home has resulted in male dogs pushing down fences and howling at doors just to get to them. It can be messy too as they produce a bloody, sticky discharge for three weeks or more. The cost of your pet’s spay/neuter surgery is far less than the cost of having and caring for a litter. You’re also likely to save money on your insurance premiums if your pet is neutered, and you ’ll not incur any of the costs associated with illness and disease resulting from remaining entire. Even insured pets who get sick still have an excess to pay each time, and many won’t be covered for a recurring infection or after the first year. As un-neutered pets are more aggressive, there are also battle wounds to consider! When hormones rage, cats and dogs don’t hold back. An unneutered dog is more likely to be the target of aggression from another dog too, even if they don’t start it. An intact male will do just about anything to mate and will be very frustrated by being restricted. The urge is almost overwhelming, and they will find ingenious ways to escape from house and garden and disappear on walks. Once he’s free to roam, dogs risk injury in traffic and both cats and dogs will fight with other males (and unwilling females). Your neutered male may be better behaved. Unneutered dogs and cats are more likely to mark their territory by spraying strong-smelling urine all over the house. Your dog might be less likely to mount other dogs, people and inanimate objects after he’s neutered. Some aggression problems may be avoided by early neutering. Surgery will reduce the amount of testosterone in your male’s system, although it won’t eliminate the hormone completely. Also if your pet has learnt behaviours resulting from hormones before being neutered and these have become habitual, then changes might be slow to happen or lessened, which is another good reason to neuter as soon as it’s possible. An unneutered dog is likely to try and scratch their particular itch themselves by mounting, and this is often at inconvenient times and on inconvenient objects such as your favourite cushion, child, aunty or leg. Neutered cats and dogs focus their attention on their human families and aren’t bothered about marking their territory by spraying very strong urine around. Once furniture or carpets have been ‘marked’ in this way, it’s almost impossible to eradicate the smell. This is unpleasant to have in the house, but also marks this area as a toilet for your pet, making them highly likely to re-offend! Neutering won’t make your pet fat, but you might need to decrease the amount of food you give them and/or increase the amount of exercise. Your pet will remain they shape they are as long as you keep an eye on their food intake. There are also pet foods specially formulated for the nutritional and calorific needs of neutered pets that are worth investigating. 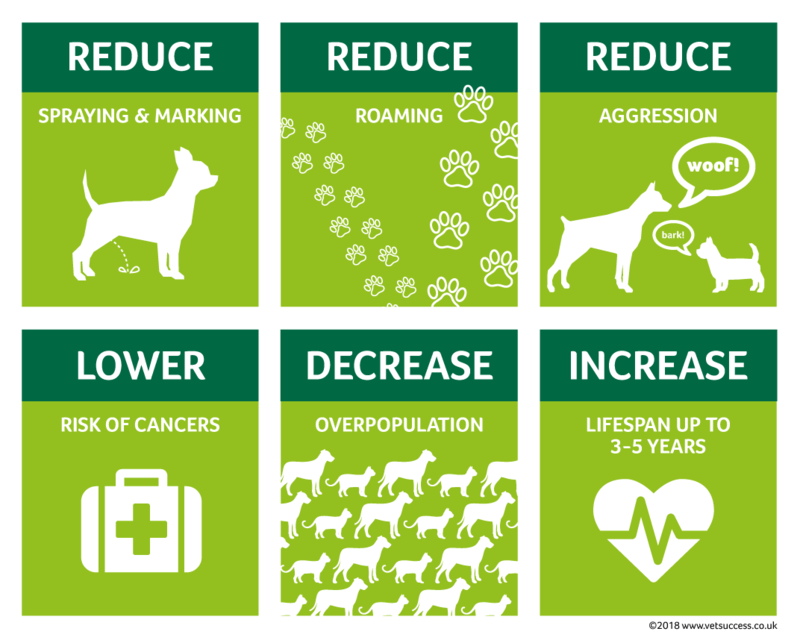 To discuss neutering your pet, call us on 01566 772211. 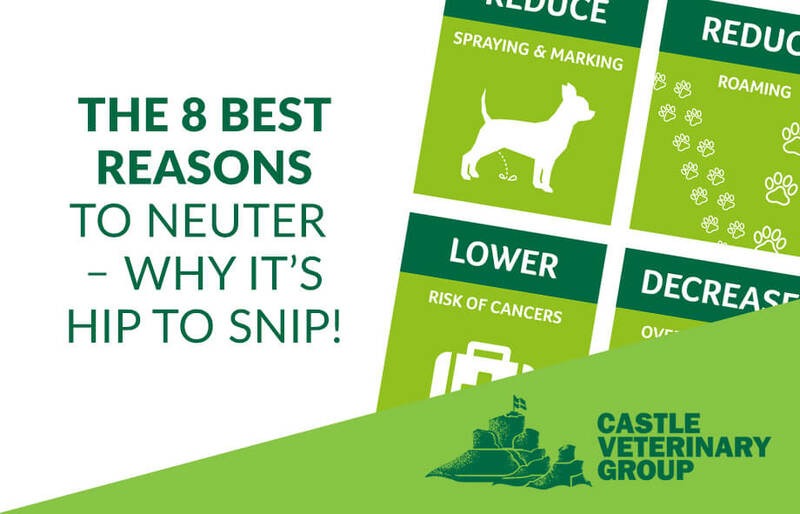 And don’t forget, if you join the Castle Care Club you’ll not only have all of your preventative care including year-round flea, worm and vaccination covered but you’ll also benefit from a 15% discount off neutering.